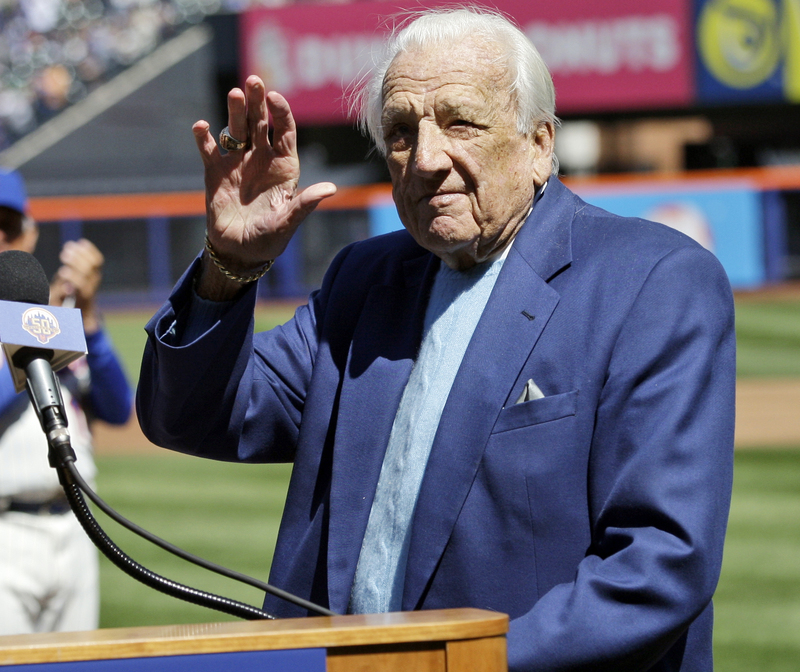 Baseball fans say goodbye to Hall of Famer Ralph Kiner, who passed away at the age of 91 due to natural causes. Fans are invited to share their condolences and special memories in the comments below. 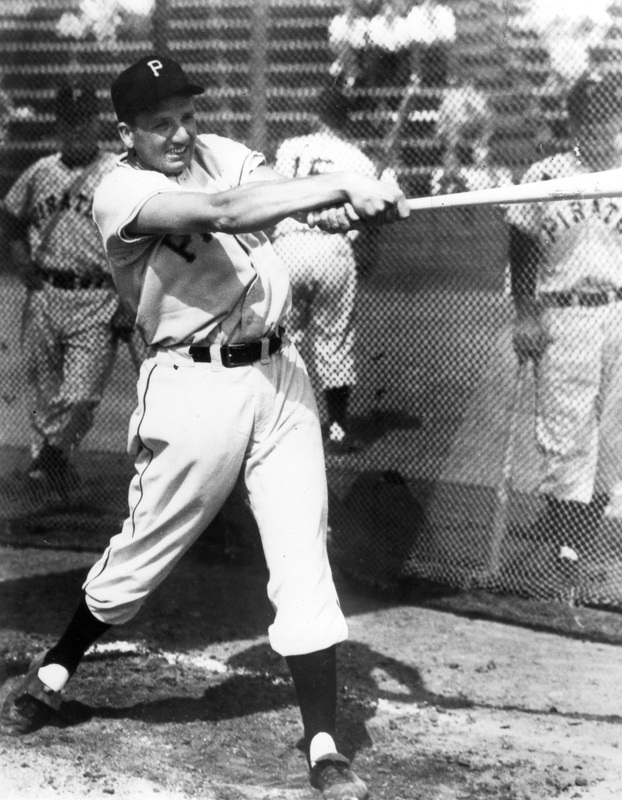 During his 10-year career, Kiner hit 369 home runs, winning or sharing the National League home run title in each of his first seven seasons with the Pirates. He twice topped 50 home runs, with 51 in 1947 and 54 in 1949. He averaged more than 100 RBI per season. Following his playing career, which was cut short by continuing back ailments, Kiner transitioned to the broadcast booth starting in 1962, where he would become a New York broadcast icon for the Mets. I grew up on the Dodgers, but Ralph and the crew made it easy for me to listen to the Mets and root for them right from the beginning, and I did not have to stay up all night listening to the Dodgers from Calif. I miss hearing his voice. I went to Pittsburgh for the first time this year and I saw the confluence of the Monogahela and Allegheny Rivers and thought of all the time I hear Ralph Kiner speak of it. He, Bob Murphy and Lindsey Nelson are the voices I hear in my Mets memories (all due respect to the present crew). I told my son the Branch Rickey story just the other day. I don’t even need to explain that to most of you because you all know which one I mean. I can picture the Kiner’s Korner set (although it is driving me crazy because I can’t remember the theme song). I became a baseball fan watching the Mets in the early 1970s and so he helped raise me as a baseball fan. I will always treasure the memories he provided me. Big Mets fans and Ralph Kiner fan as well. No one like him anymore. I remember this song so well as a kid along with many other Mets memories. Remembering Kiners corners “Foamy’s famous faces “?He was a class act with a wonderful sense of humour. I grew up a devout Mets fan and the voices of Ralph, Bob and Lindsey were a big part of my life. I would watch entire games, sometimes doubleheaders, AND of course, Kiner’s Korner. Ralph’s announcing style wasn’t polished, but it was certainly charming and filled with interesting and entertaining snippets of Ralph’s experiences. Even through all of those lackluster years for the Mets, I loyally listened to the three best baseball announcers ever. Lindsey Nelson, Bob Murphy and Ralph Kiner. Simply the Best!!!!! Ralph was the best ,I am 57 to be and my Dad and myself would watch Kiners Korner all the time. A lot of fantastic memories. God bless Ralph and my Father. RICHARD U HIT THAT STORY ABOUT RALPH KINER WAS RIGHT ON THE MONEY I HAVE ANOTHER STORY ABOUT RALPH. THE METS WERE PLAYING IN CHICAGO AGAINST THE CUBS. THERE WERE A LOT OF RAIN DELAYS. I THINK GARY COHEN WAS THE OTHER ANNOUNCER. THEY WERE RUNNING OUT OF STORIES TO TALK ABOUT. RALPH TOLD GARY HE COULD RECITE CASEY AT THE BAT IN IT’S ENTIRETY. WELL RALPH RECITED THE ENTIRE POEM BY ROTE. HE DID NOT MISS A WORD AND HE LOVED IT. GARY WAS STUNNED. RALPH WAS A CLASS ACT AND HE LOVED BASEBALL. YES I AM 66 AND I ALSO REMEMBER RALPH TALKING TO THE STAR OF THE GAME. DO U REALIZE THEY ONLY GOT PAID 50 DOLLARS. HOW TIMES HAVE CHANGED. THEY EGOS ARE TOO BIG TODAY. DID U KNOW THEY NAMED THE BOOTH AFTER RALPH. IT IS NOW CALLED THE RALPH KINER BOOTH. WHAT AN HONOR. I THINK THE METS WILL WIN 85 GAMES THIS YEAR/. RALPH KINER WHAT A BALL PLAYER ,WHAT AN ANNOUNCER,WHAT A MAN. THEY DON’T MAKE THEM LIKE RALPH ANYMORE. RALPH KINER A CLASS ACT ALL THE TIME. U CAN BUY A PIN THAT HAS A MICROPHONE ON IT AT LITTLE SHEA. U SEE I STILL CALL IT SHEA. THE RALPH KINER BOOTH. God Bless Ralph may he look after him as he did us. After Ralph’s playing days were over, wasn’t he a General Manager in the Pacific Coast League for a while before he became a broadcaster for the Mets? Ralph Kiner was a funny announcer for all Mets Fans like me. As an Original Met Fan this season missed Ralph. The future Met fans will never hear his stories or how he could use comparisons of the Kids today to the players of the past. Kiner’s Korner was what a Post Game show was all about. How lucky a man was I to have spent these years listening to Ralph. God Bless you and keep you always Ralph Kiner and thank you from all of us who were so lucky to share our time on earth with you. I’ve been a Met fan since the beginning. Ralph, Bob and Lindsey were a big part of my life. Despite the last six years, and many other losing years, I will always be part of that era,. Thanks Ralph for all the great memories. Ralph’s Kiner’s Korner brought the stars of the game & of the era into our living rooms such as Gil Hodges, Duke Snyder, Willie Mays, Hank Aaron, Pete Rose, Tom Seaver, Jerry Koosman, Ron Hunt, Willie Stargell, Willie McCovey, Bob Gibson, Sandy Koufax, Don Drysdale, Roberto Clemente, Johnny Bench,Maury Wills, Dwight Gooden, Darryl Strawberry, Gary Carter, Mike Piazza, Ron Darling, Syd Fernandez, Ernie Banks, Ron Santo, Mike Schmidt, Richie Allen, Rusty Staub, Tug McGraw, David Wright & countless other Mets and opposing team stars. Thanks for the memories Ralph / RIP. I’m guessing it was actually called “gravy,” as it was in my house! That probably was my house also! Gad do I those days. Hearing Bob, Lindsay and Ralph on the Radio and TV, Doubleheaders every Sunday! Bring back Doubleheaders! 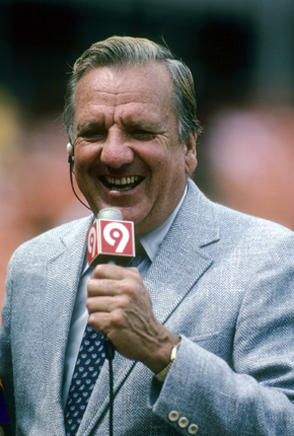 I grew up listening to Ralph Kiner call the Met games. What a joy! His insight into the game, his wonderful stories and his wit and charm will stay with me always! When i heard the news that Ralph Kiner had passed away it was so very sad. As a kid born in 1962 i have such fond memories of listening to Ralph, Lindsey Nelson, Bob Murphy. the 1969 year of course was the best for me growing up in Staten Island. I could not wait to turn on the game watching the families black and white television and see all my heroes up close. Ralph was such a true mets fan and even listening to him when he did one inning announcing games last year you could tell how excited he would get when the mets would score runs. Kiners Korner was by far the best post game. Going over all the great plays of the game. Ill never forget. Thank you Ralph Kiner for the great memories. You are sorely missed.